No matter how carefully you fold your clothes in your suitcase, there are bound to be a few wrinkles. Natural fibers like linen and cotton especially are prone to getting wrinkled. Now I don’t mind a few wrinkles here and there, but when there are too many it can spoil the look of my clothing, leaving me looking less than polished. Is a traditional clothes iron best? The most common way of removing wrinkles in your clothing is by using a traditional clothes iron. While that may be a good option at home, they are much too heavy and bulky to carry with you on your travels. You might assume your hotel provides one in your room, but unfortunately, that’s not always the case. Some hotels only provide an iron if you ask the front desk directly. Rather than worry about any of that, I just bring a travel steamer. They’re small, light, and smooth my wrinkled clothing with a few bursts of steam. 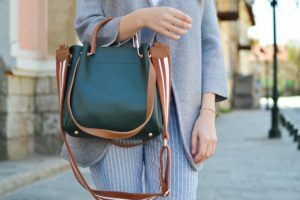 Having done my fair share of traveling over the years, I am used to opening my suitcase and being faced with various degrees of wrinkled clothes. I used to avoid bringing anything made of linen, or my favorite silk blouses. They were simply out of the question and seemed like too much trouble. I’d rather hit the breakfast buffet in the morning, than iron the wrinkles from my clothes. What finally solved my travel dilemma, was buying a small travel steamer. It’s a fashion stylist’s best friend and the reason why so many well-groomed people look so put together. Travel steamers are steam machines that heat up quickly and will turn that crumpled mess of clothing into a dry-clean worthy result. There’s no need to use an ironing board, you can just steam your clothing while it’s on the hanger. The steam loosens the clothes fibers, smoothing wrinkles out for a neat and polished look. Best of all, they are really handy to use at home when you’re not traveling, especially on bedding and curtains. Just add water! When I first tried this steam iron, I couldn’t help but notice the similarities with a traditional iron. The classic tear-drop shape and metal-iron plate are typical of an iron you’re probably used to using. But where a traditional iron can only be used horizontally on a flat surface, this steam iron can be used vertically too. 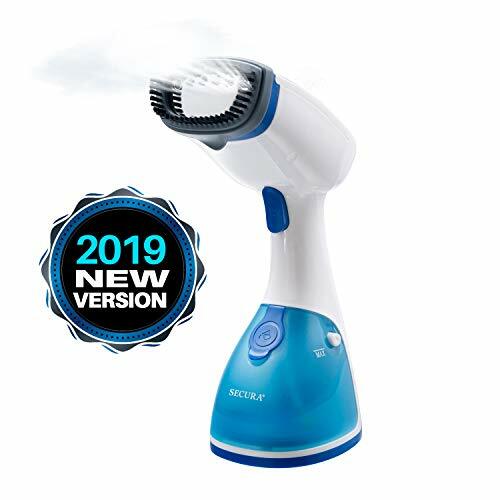 It’s like a cross between a traditional dry iron and a handheld steamer. You get the best of both worlds, which is so convenient and versatile. Create crisp edges or remove wrinkles with complete ease. The Steamfast compact fabric steamer comes with a handy temperature setting to make sure you are using the right heat for your clothing. Each setting corresponds to the fabric you are steaming for careful heat application. The one-touch steam button allows you to control how much steam is released. 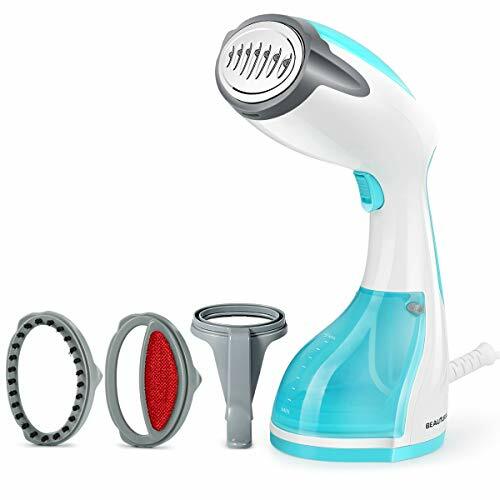 Even smaller than a travel hairdryer, this steamer takes up very little space. It weighs less than a pound, so it won’t add bulky weight to your suitcase either. The small size also reflects its water tank, which holds 1.4 oz of water, perfect for travelers. Perfect for steaming fabrics vertically or horizontally, this steamer is great to use on clothing and on tricky objects like sofas and upholstered chairs. The quality is good and the steamer feels well made. The large water tank has a rubber seal, which keeps the water from spilling out when the steamer is tilted past 45 degrees. Most upright steamers can spill when tilted too far forwards, which makes this very handy to use on a variety of objects. I found it easiest to steam my shirts, by placing a hanger on the back of a door. I like that it comes with two free attachment heads that will remove lint or help smooth stubborn wrinkles. It’s a nice little freebie. Another nice feature on this steamer is the trigger steam button. It allows you to hold it down whenever you want to release the steam. And if you need to steam fabric for a few minutes in a row, lock the trigger so that the steamer lets out steam continuously. Although it’s one of the bigger steamers on the market, it’s still similar in size to the average hairdryer. I found the handle was comfortable to use and is good for any sized hand because of the long-handle design. The cord is nearly eight feet long, so you can stand a fair distance from the outlet while steaming your fabrics. Specifically designed to steam your clothes while they are upright, this classic steamer quickly gets the wrinkles out of your clothes. The large water tank makes this a good choice if you need to steam many items of clothing at one time or larger fabrics such as curtains. 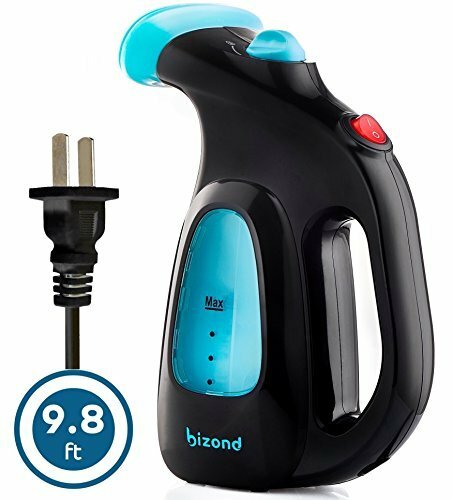 This handheld steamer weighs just over one pound and is the same size as a compact hair dryer. Filling the tank is straightforward and is as easy as sliding the nozzle off. The steamer’s handle feels comfortable and secure and gives you control over the areas you are steaming. Just lay the nozzle over the fabric in long sweeping motions. 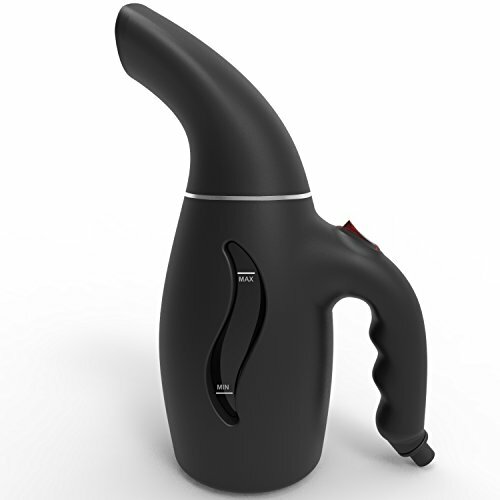 With an ergonomic handle and large water tank, this is a well-designed travel steamer. The small size makes it easy to pack with your luggage. It weighs a little more than a pound, but it feels comfortable to hold while you steam your clothing. Like most upright steamers, make sure to hold it upright and not tilt it past 45 degrees. To be honest, you’d really have to go out of your way to tilt it past 45 degrees. Starting it up is easy, just switch the on/off button and wait about 90 seconds for it to warm up. Because of the larger water tank, it takes a few seconds longer to heat up when the tank is full. It works really well on t-shirts, dresses, and most fabrics. Denim fabric is especially thick, so takes a little longer to get the wrinkles out. Other than that, it’s a nice little travel steamer. 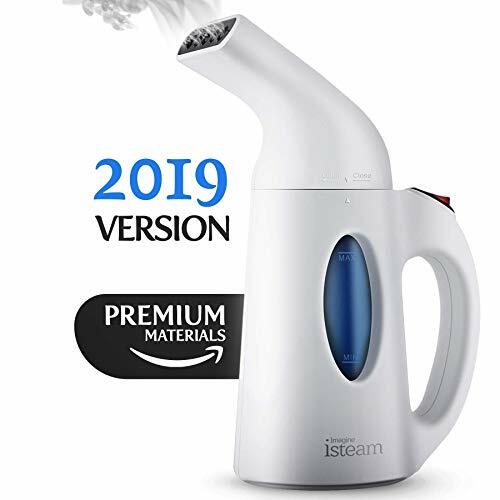 If you want a hand steamer that will not spill, no matter what angle you use it, this is a great steamer. The water tank is separate to the outer casing and is completely sealed shut. The anti-spill design makes it easy to steam awkward items such as couches and furniture. Using it at any angle is a piece of cake. A brush attachment comes included with the steamer and is great for keeping the fabric taut while you steam the wrinkles out. I found that it worked well on my husband’s long-sleeve shirts. Usually, the arms can be tricky to steam, but with the brush attachment, I found it much easier to do. 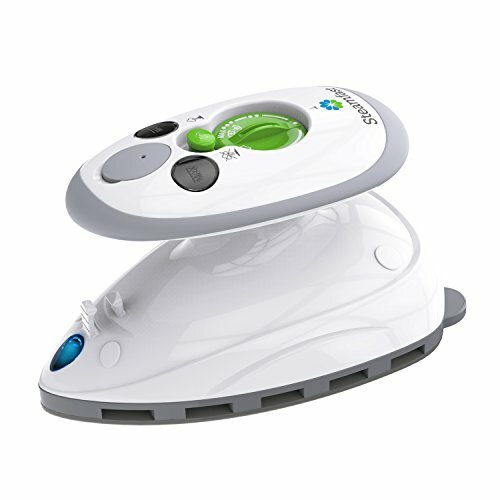 This compact steamer from Secura has a nice simple design and is great for steaming fabrics at home or when traveling. It comes with a free fabric brush, which helps to smooth out wrinkles as you steam your fabric. It also helps to keep the fabric taut. I always like a steamer with a trigger, so I was glad that this steamer comes with a steam trigger. It controls the flow of steam and can be stopped and started whenever you want. It has slightly larger steam holes, which allow more steam to come out. More steam is better at getting those stubborn wrinkles out. Traveling with a steamer makes packing less frustrating, because I know I don’t have to worry about fabrics wrinkling when they are folded in my suitcase (I’m talking to you linen!). My steamer heats up in less than a minute and wrinkles disappear with a sweep of my hand. I’ll still own a traditional iron for creating crisp edges at home, but for everything else, I’ll stick with my speedy steamer. These are my favorite steamers, but what about you? Do you already own one that you love? If so, please share!